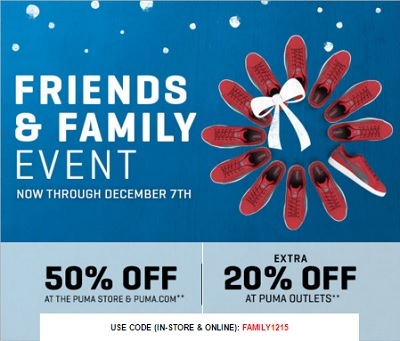 Visit any PUMA store in the U.S. and enjoy shopping during Friends & Family Event. Receive 50% discount at PUMA stores and online on the official website. Or, receive an extra 20% discount at PUMA Outlets. Source of the information is PUMA. Offer expires 12/07/2015. More details at stores.